The Washington Post falls back into its 2005 mode of blaming Iran for the capabilities of a local insurgency. This time it is not Iraq where Iran is allegedly providing to insurgents, but Bahrain. Old and debunked claims are hauled up and propaganda from the U.S. proxy Sunni dictatorship is cited as "evidence". It is a top-right front-page story in the Sunday edition and thereby "important". It is also fake news. The report, a copy of which was shown to The Washington Post, partly explains the growing unease among some Western intelligence officials over tiny Bahrain, a stalwart U.S. ally in the Persian Gulf and home to the Navy’s Fifth Fleet. Six years after the start of a peaceful Shiite protest movement against the country’s Sunni-led government, U.S. and European analysts now see an increasingly grave threat emerging on the margins of the uprising: heavily armed militant cells supplied and funded, officials say, by Iran. While Bahraini officials frequently accuse Tehran of inciting violence, the allegations often have been discounted as exaggerations by a monarchy that routinely cites terrorism as a justification for cracking down on Shiite activists. Surly, "current and former intelligence officials" are paragons of truth and veracity and whatever they claim MUST be true. At issue is the detection of one basement workshop in Bahrain where someone is using "$20,000 lathes and hydraulic presses" to produce shaped charges and also stored a pile of C4 explosives. A $20,000 lathe is at the lower end of low-quality professional tooling. Hydraulic presses can be made from car jacks. 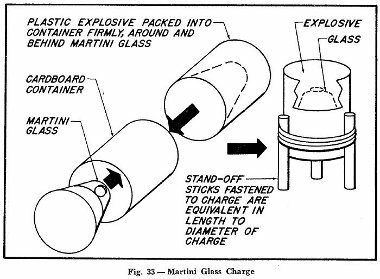 How to make hollow charges and explosive formed penetrators (EFPs) is described in the CIA's Explosives for Sabotage Manual which the U.S. translated and distributed for decades in Afghanistan and elsewhere. C4 explosives of various origins, including from Iran, are available on black weapon markets throughout west-Asia. One of the six caches “involved C-4 in its original Iranian military packaging,” the report said. The piece does not note where the C4 in the other five caches came from. A detailed chemical analysis will be able to find the "signatures" of the chemical production facilities. If only one of six explosive caches comes from an Iranian manufacturer the problem Bahrain has on hand with the C4 is hardly of Iranian origin. So why are the manufacturing origins of the other five caches of explosives not mentioned at all? Did those caches come from the U.S. or from Saudi factories? But the problems with the piece do not end there. After noting how unreliable Bahrain official claims are, it discussed at length such Bahraini claims. saw echoes in Bahrain of Iran’s practice of supplying tank-crushing EFPs to Iraqi Shiite militias, which used the devices in an effort to create no-go zones around Shiite strongholds. For quite a while this story has been debunked by reports about EFP manufacturing in Iraq. These were substantiated, while the "Iran provides EFPs" meme was never proven by any evidence. There were pieces in the Wall Street Journal, Los Angeles Times and by Reuters. Doubts about the Iran origin of EFPs have also been raised in the New York Times. NBC news had U.S. officials at least partly walking back their claims. The Columbia Journalism Review, Inter Press Service and Newshogger Cernig ran good summary stories including many sources. We also discussed the 'evidence' here. The WaPo story, though on today's Sunday paper's frontpage, has a (web-)dateline of April 1. That is probably the only reliable claim it carries. There is no evidence that Iran provides for a Shia insurgency in Shia majority-Sunni ruled Bahrain just as there is no evidence that it supplies Zaidi fighters in Yemen who fight Al-Qaeda and its Saudi sponsors. But there is by now a steady stream of Saudi and U.S. propaganda that makes such claims. These claims sound awfully similar to the claims made before the war on Iraq of (non-existing) Iraqi weapons of mass destruction. To find such again on page one of the Sunday edition of a major newspaper is more than disturbing.